Ivoclar IPS e.max is a state-of-the-art restorative material utilized in several applications with great success. The following case documents the results that were achieved with my last reconstruction. 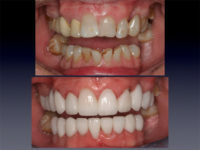 Gear up for patient satisfaction and a gorgeous cut back/layered ceramic outcome! I was introduced to my patient Bob at a time in his life where he was ready to address a number of dental problems. 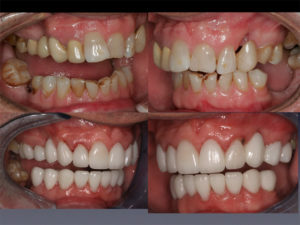 We began the first phase of treatment by addressing periodontal issues and bone support to restore optimum oral health. 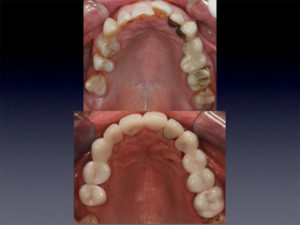 Perio, Grafting, and Bridgework, Oh My! 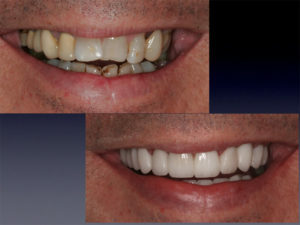 After performing periodontal therapy to improve soft tissue health, Bob also underwent bone and tissue grafting in tooth #10/11 area to create a more ideal site for fixed bridgework. This case is a great example of the benefits of a cut back and layered ceramic. Because of Bob’s complex occlusion and significant darkness of preparation shade, I discussed the material choice with Gold Dust’s aesthetic team. They recommended e.max for coverage and strength. My patient is so pleased with the result. We’ve re-established an occlusal scheme that will create stability and has already arrested the wear process. The ceramics were outstanding and gave me a whole new appreciation for the partnership of my lab in complex cases! “I’ve always been self-conscious about my teeth. Even after having a lot of dental work done throughout the years, I never had healthy looking teeth. Over time, much of that dental work started to fail and it was time to consult with an expert to really solve the issues I was having. I’m so privileged to have been introduced to Dr. Will Lacey. Instead of discussing the replacement of just what was broken, he really looked at the big picture and created a plan to give me stability, make sure the dentistry I was investing in had longevity, and finally that it looked great. Dr. Lacey is a true professional and technically exceptional, as is his whole team. His commitment to my comfort and his attention to detail made me realize I was in exactly the right place. In just a couple of months, I am now free of decay and breakdown and have a really stunning smile that fits me. My wife loved my teeth so much, she also got veneers! My only regret is that I didn’t find Dr. Lacey 10 years sooner! Thank you Dr. Lacey for your outstanding care! !